Sentence by sentence, line by line, lighthouse casts horizons. A possible allusion to Virginia Woolf's To The Lighthouse can be discerned in the sense of suspense, of preparation and promise that pervades the text, a sense of things underway. But that it is present excitement and expectation rather than some terminus out in the future that is art's (and life's?) ultimate achievement is clear from the outset. Of course, one can't think of a lighthouse without being aware of the slippage of its illumination and the concealment that surrounds what's revealed. A strange narrative -- a narrative of the strangeness of what is -- comes into view. lighthouse is about the experience of being on the way, distance by distance. We move from part to whole and whole to part again, "the proximity unveiling a subtle inquiry." Raised in the Colorado Rocky Mountains, M. Mara-Ann has called San Francisco home for more than ten years. She completed undergraduate studies at the University of Colorado, Boulder and the University of Linköping, Sweden and partial graduate work at New College of California in San Francisco. Recent work includes the chapbook forthcoming: ecneles (a+bend press, 2000) and a CD collaboration with composer Sean Abreu entitled Water Rights (2000). She is the publisher of WOOD, an online experimental journal featuring collaborations between poets and visual artists. 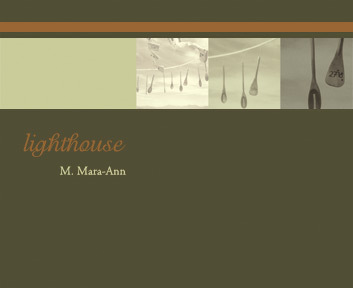 lighthouse is Mara's first book. You can buy this book online from Small Press Distribution!